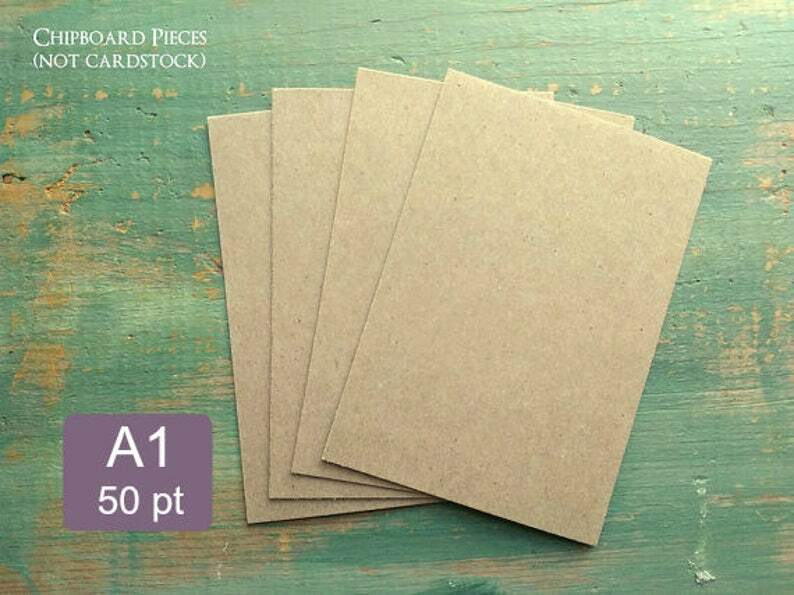 Select an option Traditional A1 Cut to 3.5" x 5" Cut to 3" x 5"
• chipboard pieces can be cut to: 3 1/2" x 4 7/8", 3.5" x 5", or 3" x 5"
Chipboard pieces are much thicker than cardstock and as such, are not recommended for use in printers as they don't bend well and may have trouble feeding through. • Looking for a unique quantity or custom cut size? Please inquire! *Thanks for supporting small businesses and eco-friendly options! Exactly as described and worked perfectly - prompt shipping! Thank you! Can you print my logo or information on your products? Sorry, but we do not offer custom printing at this time. I live in CT, can I pick up in person? Sorry, but since we are set up as an internet business and don’t have a public store front, our insurance policies don't allow us to conduct business with local customers at our current location. However, shipping to other locations in Connecticut typically only takes one business day and often at a discounted local rate. Oops, I had the wrong address listed (or didn't pick up from the post office in time). We're happy to reship your package once we receive it back; however, shipping costs will need to charged again. If you prefer a refund, we're happy to do so minus original shipping costs. Lost shipments due to a wrong shipping address provided by the buyer will not be the responsibility of the seller. In instances where unopened packages are returned to us by the buyer, by the buyer's post office due to no pick-up or by customs due to VAT/import fees not being paid by buyer (outside of US), original shipping charges will not be refunded. I'm located outside the US, will I have to pay VAT/GST/Import Taxes or Fees? Some countries, particularly the UK, will apply additional VAT, customs fees, import duties and/or handling charges/taxes on imported packages, depending on your country’s import limits; buyers are responsible for any import charges imposed by their home country. We are legally required to fill out customs form accurately, listed as merchandise, with purchase price paid listed and will not honor requests to do otherwise as it is illegal for us to do so. Thank you for understanding. Can you do custom sizes? On cards, yes, we can cut to size up to a certain point (dimensions of the paper), just send us a message with information on what sizes you're looking for, the quantity, the color/weight option of the cardstock and the location it's shipping to so we can get you a price/shipping quote. The envelopes are a supply we stock, not make so we're not able to adjust the size, but we still encourage you to ask as we may have it elsewhere in the shop or can special order it in for you. Can you do custom quantities? Yes! Although we sell most items in 25, 50 and 100 packs, we are happy to create a custom listing for a unique quantity. Need 65? No problem, just send us a message along with your location and we'll get you a price/shipping quote. Do you offer bulk quantities or discounts on larger orders? Yes, we can do bulk quantities on most items. For cards and/or envelopes, we offer 10% off 500 or 20% off 1,000 of the same item. For other items (i.e. journals), bulk quantities are much lower, so just send us a message on what you're looking for along with your location and we're happy to get you a price and shipping quote. We also offer other discounts when your purchase meets a certain limit: purchase $125 and get 10% off with BULK125 coupon code at checkout; purchase $200 get 15% off with BULK200 coupon code (not eligible on custom bulk quantity listings already discounted).